Qatar football team beat the UAE 4-0 to enter the final of the AFC Asian Cup 2019. The match, however, was marred by unruly and ugly behaviour from the UAE fans, something that was not expected despite apprehensions and conspiracy reports before the tie which was dubbed the ‘Blockade Derby’ referring to the political power play and turmoil in the region. 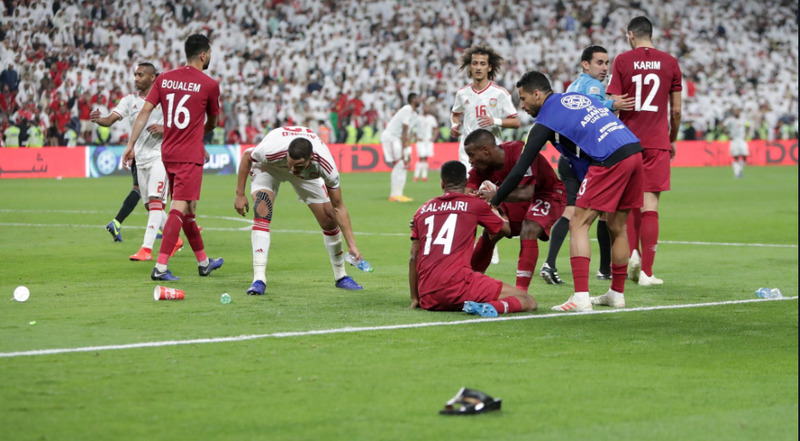 UAE spectators hurled bottles and footwear towards Qatar football team players during the AFC Asian Cup 2019 semifinal match between the two sides in Abu Dhabi on January 29. A football game was played last night. A football game won. And a football game lost. But that was only the colourful backdrop to an ugliness that many had predicted but few neutrals actually expected to transpire. Qatar, the rising footballing nation of Asia, having hammered their not-quite-so-friendly neighbours UAE (the hosts no less) 4-0 will now meet Japan in the final of the AFC Asian Cup 2019. A perfect starting point for their FIFA World Cup 2022 campaign as hosts. West Asia meets East Asia. A world of cultural cliches will open for pundits to pundit on. But that is the future. Simultaneously now, we must also talk about the past. Last night’s history influenced by a tumultuous recent history. It was billed as the second ‘Blockade Derby’ of the AFC Asian Cup — in the first Qatar laid two over Saudi Arabia to top their group — and in its build up all the conspiracies, the constraints, the commentary was laid bare. Fox Sports Asia reported that the Abu Dhabi Sporting Council was accused of buying out all the tickets for the game and giving them away for free to locals, in order to make sure no Qatar supporters got inside the stadium. A blockade for a blockade. An alternative, somewhat more hushed up news report at the Khaleej Times, told of tickets selling like hotcakes. As if hotcakes sell in Abu Dhabi, a city obsessed with muscle ups and MMA. Qatar’s in house guys made no bones about it. Whether there were tickets or not, no Qatari worth his head was going to attend the game anyway. All of this was before the game. If even after all this, there was an expectation of some Qatari colours on the stands of the Mohammed Bin Zayed Stadium in Abu Dhabi, they were dismissed outright with the first available footage. White filled the stands. A mosaic went up before the pre-game formalities. It spelt out FINAL. What was that supposed to mean? Ominous? Factual? Hopeful? Who could tell. Then the pre-game formalities… And the Qatari national anthem was greeted by a vociferous crowd. Well it was not an acapella rendition of the anthem but boos. Here let’s digress. Football, or even sport, has forever maintained this unreal stance that they move above and beyond the realm of politics on planet earth. Sport is the great leveller, the great equaliser. It seems more beneficial after all to showcase oneself as a global force for good, than a global force for merchandising, sponsorship and soft power. Last month FIFA president Gianni Infantino announced during a speech at — believe this — the G20 world leaders forum: “Football can bring us together and make the world a more prosperous, educated, equal and perhaps even peaceful place”. All of this double speak while they siphon off millions, see human rights crimes committed to fulfill the 2022 FIFA World Cup, and ensure that pockets are filled where they must be filled, and are emptied when required otherwise. A wholesome response to this would of course be the puzzled face emoji, but why use them when perhaps a more human account will do. Under FIFA’s watch, under the the Asian Football Confederation’s (AFC’s) watch — and indeed by proxy under their supervision — refugee footballer Hakim Al-Araibi is right now detained in Thailand and is fast tracked for extradition to Bahrain where he faces life imprisonment or worse for his family's political activities. For context, the president of the AFC is Salman Bin Ibrahim Al-Khalifa, a Bahraini, who has clearly said that ensuring his safe return to Australia (where he holds refugee status) is not the AFC’s responsibility. Politics and sport are, of course, removed. So to the sport then. Qatar did the civilised thing then, putting a drubbing on their hosts, enduring a cascade of boos, a cavalcade of footwear (imagine losing a game and then going home barefoot) and nipping in the semifinals a dream run that was brought about more by over achievement than realism. Think it through. The UAE reached the semifinals of the Asian Cup after an edgy draw against Bahrain, a testy win against India (If only Chhetri and Ashique had buried those chances) and a limp draw to Thailand. They beat Kyrgyzstan in the round of 16, but not before conceding two and making their lives hell. Against Australia came their crowning glory. A tight, defensively solid performance, with a blockade midfield regime (forgive the pun) and the sneaky goal to knock the defending champions out. Against a fast, furiously high pressing Qatar team they were lost from the start. And shown up. Qatar have now scored 16 goals in the competition without conceding once. Almoez Ali has now done something not seen since 1996. He has scored eight goals in a single Asian Cup, the first time this has been done since the legendary Ali Daei did it in 1996. By any account, all of this is very real footballing progress. A first Asian Cup final to go with their World Cup bid. A first title triumph will mean they will make the World Cup as Asian champions. It seems strange to bet against Japan now, but why not. One thing is guaranteed. The atmosphere will be far more genial. The match less tempestuous. And the UAE won’t like it. Qatar taking a valuable object back from the UAE home. Forgive the politics. In North Kashmir's Sopore, football was always the no. 1 sport.